We “James Shaw & Son” are a family business have been operating with pride for over 65 years. Today we operate a fleet of 15 trucks 24hrs – 7 days a week and work with a close network of long term strategic partners enabling us to cover all areas of the UK & Ireland. We have the capability of moving anything from 1 pallet to a full truck load operating under Road Haulage Conditions of Carriage 2009 and we also have an array of different trailer types allowing us to accommodate Flat Bed or Refrigerated load requests as well as General Haulage. James Shaw & Son offer bespoke services such as customer on site transport management enabling customers to outsource their transport requirements to experienced staff who specialise in transport. We work with a number of blue chip customers and continue to grow relationships through the excellent service we provide. Mr James Shaw commenced trading alongside brothers George and Peter Shaw. During this time, they carried pit props for the National Coal Board, they transported fertilizer to farms across the northwest and hauled glass products all over the UK, which were all thriving industries in St Helens during this period. 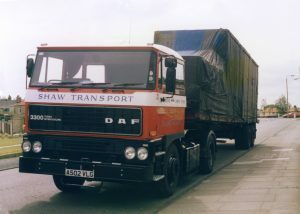 It is difficult to ascertain the exact livery colouring as Stephen Shaw was far too young to remember and unfortunately James Shaw is no longer with us, however, the truck that James used was a “Bedford S Series” rigid truck. As demand increased they bought their first articulated vehicle and quickly extended their fleet up to eight vehicles which at that time required “A licences”, theirs were national which were very rare at that time. During 1967-1968 a combination of government policy and company closures resulted in James, George and Peter selling some of their vehicles and pursuing other business ventures. However, they always kept the business going albeit on the back burner. Almost a decade after the company slowed almost to halt, James’s son, Stephen Shaw joined the business and they changed the name to James Shaw & Son. As the company had been dormant for some time James and Stephen had to start basically from scratch so they invested in a rigid vehicle and worked as a partnership James as the driver, Stephen as his 2nd man. In 1979, son Stephen passed his HGV class 1 and continued the business and James returned working in his shop with wife Beryl. Stephen now the sole owner of James Shaw and Son breathed new life in to the business and he won various contracts across the Northwest. In 1982 James Shaw and Son started working for United Glass in St Helens. They bought their first new tractor unit which was a 32T DAF 3300. 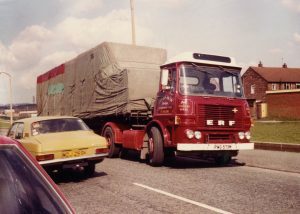 By the mid 80’s they had expanded their fleet with DAF vehicles 3300, 2800 & 350, these were paired with curtain sided trailers and flat trailers with twist locks, this allowed them to move into the paper and timber industries providing both storage and transportation solutions. Also James Shaw and Son updated their livery to the Red, White & Black, this eventually became the livery that you see on the roads today. 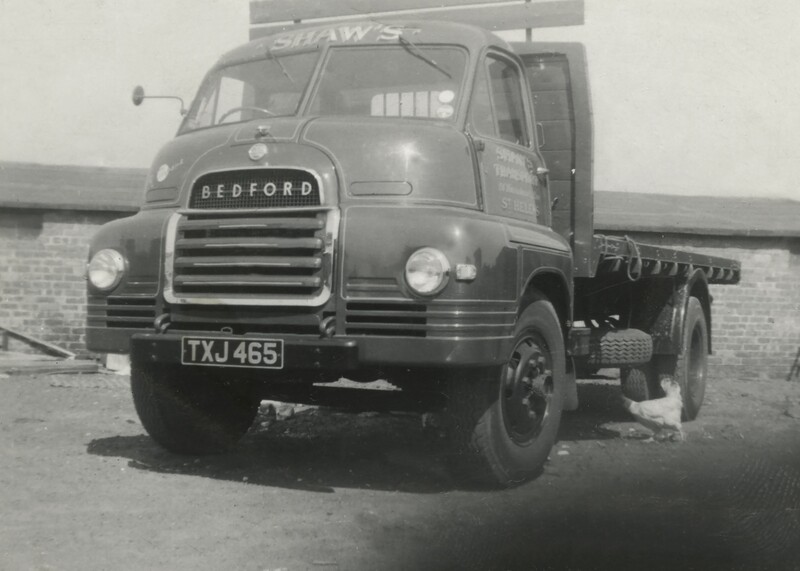 James Shaw & Son operated our first warehouse in Liverpool Freeport, handling fabric for the wet wipe industry and heavily specialised in the paper industry all over the UK. In 2007, James Shaw sadly passed away leaving son Stephen too successfully run the family business. Stephen replaced the DAF units for Scanias, he established key relationships with major logistics providers offering excellent sub-contracting services 24hrs, 7 days per week. James Shaw & Son continued to support various companies with Day Hire services operating 24/7 moving confectionary and various food products in refrigerated trailers. In 2016, James’s grandson and Stephen’s son, Andrew Shaw joined the business. Andrew helped to win a variety of large contracts, such as Nice Pak – one of the worlds leading wet wipe manufacturer and Indespension Trailers – one of the UK’s leading trailer manufacturers. This allowed James Shaw and Son to grow and expand their fleet, they now operate 15 vehicles and own a variety of trailers including refrigerated trailers, flat bed trailers and curtain side trailers, allowing them to be versatile with the services they can offer. 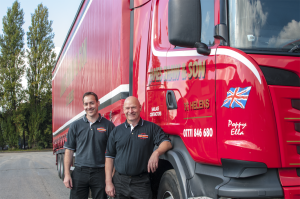 The business today specialises in UK general haulage and is run by Andrew alongside father Stephen, both are always looking for opportunities too expand. As time moves on, this business is still very much a family affair.